There were many sides to my father, Gustavo. He was trained as a chemical engineer, spoke fluent French, English, and German, was an astute businessman, a well-known philanthropist and art collector, a world-wide traveler, a connoisseur of fine wine and dining, a man of wisdom to whom many came for help and advice. 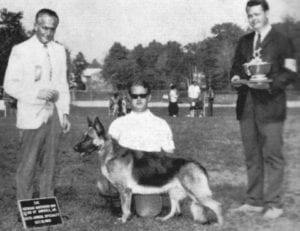 What is not widely known about him is he was a dog show judge. Yes, that’s right. His specialty was German Shepherds. He flew all over the country judging them. 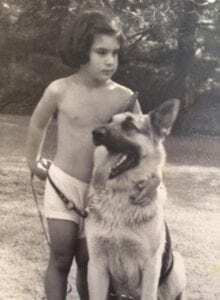 As I’ve said before, my memory goes way back, and there were always dogs. 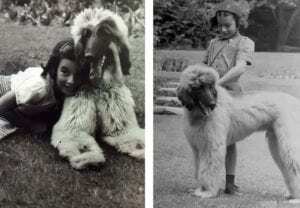 First Afghan Hounds. 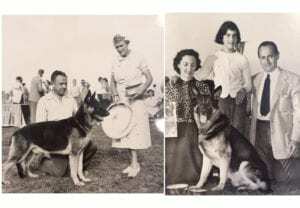 And then German Shepherds with the intermittent dachshund or poodle. We had a kennel on one side of our house in Sands Point. Three big runs. Indoor grooming, feeding and whelping areas. Two trainers: Mr. Dewy and Mrs. Strickland, both of whom were mythic characters in my life – Mr. Dewy because of his name, which I liked to roll off my tongue, and because he was the heaviest person I’d met up to that point; and Mrs. Strickland because she was so beautiful and commanding, kind of like her name. I’m not sure when my father got his dog show judge license, perhaps after we moved into the city and he no longer had a kennel. He was much-loved by everyone in the dog world. At Christmas he’d get cards from all over the country: ‘Dear Gus and Mrs. Gus,” which my mother found appalling but which must have really tickled my father’s ego. To me it’s funny that my father, who became so well-known as a collector and authority on African and Oceanic art, had this odd show judge subspecialty. 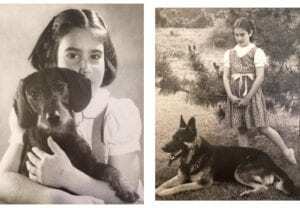 Years later, when I met my husband George Jeffords, it was dogs that connected our two families. Seriously. 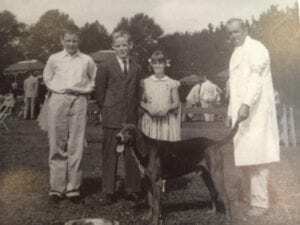 His mother was quite apprehensive about the match until she laid eyes on my distinguished father and realized that, among other things, they had dogs in common. But that’s another story.